Social media network Buzznet today announced the closure of a $6 million round of financing led by Redpoint Ventures and Anthem Venture Partners. Buzznet is the largest social network site you’ve possibly never heard of. The Sunset Boulevard based company was established in 2003 and was last covered by TechCrunch in June 2005. Buzznet has an extraordinary presence given it only returns a page and a half of results in Google News (at the time of writing). 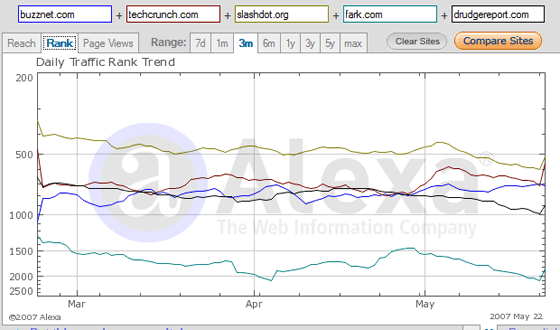 Buzznet ranks in the Top 1000 sites online according to Alexa and the Top 500 according to Compete. The company boasts of having over 6 million users and is the fastest growing social networking site according to data from Hitwise. The site launched with an initial focus on music and has evolved into something like Flickr meets MySpace. BuzzNet is primarily a photo-sharing community with a much stronger pop-culture focus than similar services. Users share news, participate in community groups, vote on polls, keep journals…and yet it’s not like MySpace, it’s hard to describe. The pop culture/ music focus is working well for Buzznet. Fall Out Boy, AFI, Cartel, up-and-coming indie artists and “internet celebrities” such as Jeffree Star now call Buzznet home. Obscurity though seems to be working for Buzznet and the traffic and ranking figures speak volumes for the service. Hitwise ranked Buzznet at No. 17 on its list of Top 20 social network sites in March, Buzznet having the same market share as Windows Live Spaces and not far away from Friendster and Google’s Orkut. With $6 million in the bank it’s a company that is not only going places, it’s unlikely to ever return to relative obscurity again in the future.